Crosby Marketing Communications continues to expand with the addition of three new team members. 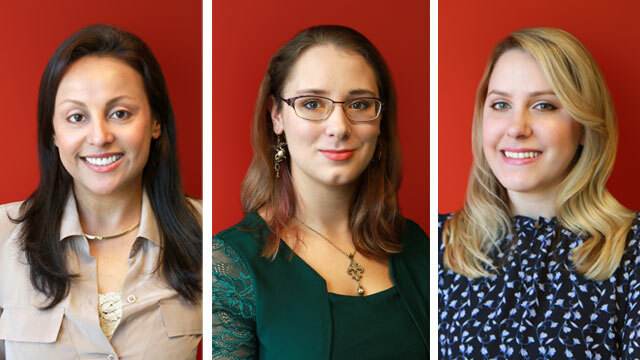 Mini Johri has been hired as a Senior Production Manager, Ashley Stryker as a Copywriter and Hayley Garfield as a Multimedia & Digital Marketing Coordinator. As Senior Production Manager, Johri will manage the workflow and integration of multimedia projects to ensure production schedules are met throughout the agency. She comes to Crosby with strong agency production and project management experience on both coasts, having started in New York City with Deutsch. After moving to Los Angeles, Johri became a Management Supervisor at Ogilvy & Mather, then a Digital Management Supervisor at Kastner & Partners. She is a graduate of Endicott College in Beverly, Mass., earning a degree in Communications with a concentration in Advertising. 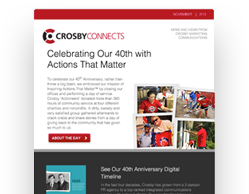 As a Copywriter, Stryker will create content for a variety of Crosby clients, including Military OneSource, the Department of Defense’s flagship digital services platform that supports service members and their families across the globe. She has nearly a decade of experience crafting content for both digital and print mediums, most recently working as a Content Marketing Manager for Eyewitness Surveillance and as a Digital Content Writer for Independent School Management. Stryker graduated from East Stroudsburg University of Pennsylvania with a B.A. in English. In her position as Multimedia & Digital Marketing Coordinator, Garfield will support all areas of production, including managing Crosby’s digital assets management system, photography resourcing/licensing, 508 compliance and coordination with vendors. She graduated from Marymount University with a Bachelor of Arts Degree in Communications and was most recently a Marketing Associate at Sotheby’s Realty.